The night sky, is the night sky, is the night sky. The constellations you learned as a child are the same constellations that you see today. Ancient people recognized these same constellations. Oh sure, they might not have had the same name for it, but essentially, we see what they saw. But when you see animations of galaxies, especially as they come together and collide, you see the stars buzzing around like angry bees. We know that the stars can have motions, and yet, we don’t see them moving? How fast are they moving, and will we ever be able to tell? Stars, of course, do move. It’s just that the distances are so great that it’s very difficult to tell. But astronomers have been studying their position for thousands of years. Tracking the position and movements of the stars is known as astrometry. We trace the history of astrometry back to 190 BC, when the ancient Greek astronomer Hipparchus first created a catalog of the 850 brightest stars in the sky and their position. His student Ptolemy followed up with his own observations of the night sky, creating his important document: the Almagest. In the Almagest, Ptolemy laid out his theory for an Earth-centric Universe, with the Moon, Sun, planets and stars in concentric crystal spheres that rotated around the planet. He was wrong about the Universe, of course, but his charts and tables were incredibly accurate, measuring the brightness and location of more than 1,000 stars. A thousand years later, the Arabic astronomer Abd al-Rahman al-Sufi completed an even more detailed measurement of the sky using an astrolabe. One of the most famous astronomers in history was the Danish Tycho Brahe. He was renowned for his ability to measure the position of stars, and built incredibly precise instruments for the time to do the job. He measured the positions of stars to within 15 to 35 arcseconds of accuracy. Just for comparison, a human hair, held 10 meters away is an arcsecond wide. Also, I’m required to inform you that Brahe had a fake nose. He lost his in a duel, but had a brass replacement made. In 1807, Friedrich Bessel was the first astronomer to measure the distance to a nearby star 61 Cygni. He used the technique of parallax, by measuring the angle to the star when the Earth was on one side of the Sun, and then measuring it again 6 months later when the Earth was on the other side. With parallax technique, astronomers observe object at opposite ends of Earth’s orbit around the Sun to precisely measure its distance. Credit: Alexandra Angelich, NRAO/AUI/NSF. Over the course of this period, this relatively closer star moves slightly back and forth against the more distant background of the galaxy. And over the next two centuries, other astronomers further refined this technique, getting better and better at figuring out the distance and motions of stars. But to really track the positions and motions of stars, we needed to go to space. In 1989, the European Space Agency launched their Hipparcos mission, named after the Greek astronomer we talked about earlier. Its job was to measure the position and motion of the nearby stars in the Milky Way. Over the course of its mission, Hipparcos accurately measured 118,000 stars, and provided rough calculations for another 2 million stars. That was useful, and astronomers have relied on it ever since, but something better has arrived, and its name is Gaia. Launched in December 2013, the European Space Agency’s Gaia in is in the process of mapping out a billion stars in the Milky Way. That’s billion, with a B, and accounts for about 1% of the stars in the galaxy. The spacecraft will track the motion of 150 million stars, telling us where everything is going over time. It will be a mind bending accomplishment. Hipparchus would be proud. With the most precise measurements, taken year after year, the motions of the stars can indeed be calculated. Although they’re not enough to see with the unaided eye, over thousands and tens of thousands of years, the positions of the stars change dramatically in the sky. The familiar stars in the Big Dipper, for example, look how they do today. But if you go forward or backward in time, the positions of the stars look very different, and eventually completely unrecognizable. When a star is moving sideways across the sky, astronomers call this “proper motion”. The speed a star moves is typically about 0.1 arc second per year. This is almost imperceptible, but over the course of 2000 years, for example, a typical star would have moved across the sky by about half a degree, or the width of the Moon in the sky. A 20 year animation showing the proper motion of Barnard’s Star. Credit: Steve Quirk, images in the Public Domain. The star with the fastest proper motion that we know of is Barnard’s star, zipping through the sky at 10.25 arcseconds a year. In that same 2000 year period, it would have moved 5.5 degrees, or about 11 times the width of your hand. Very fast. When a star is moving toward or away from us, astronomers call that radial velocity. They measure this by calculating the doppler shift. The light from stars moving towards us is shifted towards the blue side of the spectrum, while stars moving away from us are red-shifted. Between the proper motion and redshift, you can get a precise calculation for the exact path a star is moving in the sky. We know, for example, that the dwarf star Hipparcos 85605 is moving rapidly towards us. It’s 16 light-years away right now, but in the next few hundred thousand years, it’s going to get as close as .13 light-years away, or about 8,200 times the distance from the Earth to the Sun. This won’t cause us any direct effect, but the gravitational interaction from the star could kick a bunch of comets out of the Oort cloud and send them down towards the inner Solar System. The motions of the stars is fairly gentle, jostling through gravitational interactions as they orbit around the center of the Milky Way. But there are other, more catastrophic events that can make stars move much more quickly through space. When a binary pair of stars gets too close to the supermassive black hole at the center of the Milky Way, one can be consumed by the black hole. The other now has the velocity, without the added mass of its companion. This gives it a high-velocity kick. About once every 100,000 years, a star is kicked right out of the Milky Way from the galactic center. Another situation can happen where a smaller star is orbiting around a supermassive companion. Over time, the massive star bloats up as supergiant and then detonates as a supernova. Like a stone released from a sling, the smaller star is no longer held in place by gravity, and it hurtles out into space at incredible speeds. Astronomers have detected these hypervelocity stars moving at 1.1 million kilometers per hour relative to the center of the Milky Way. All of the methods of stellar motion that I talked about so far are natural. But can you imagine a future civilization that becomes so powerful it could move the stars themselves? In 1987, the Russian astrophysicist Leonid Shkadov presented a technique that could move a star over vast lengths of time. By building a huge mirror and positioning it on one side of a star, the star itself could act like a thruster. Photons from the star would reflect off the mirror, imparting momentum like a solar sail. The mirror itself would be massive enough that its gravity would attract the star, but the light pressure from the star would keep it from falling in. This would create a slow but steady pressure on the other side of the star, accelerating it in whatever direction the civilization wanted. Over the course of a few billion years, a star could be relocated pretty much anywhere a civilization wanted within its host galaxy. This would be a true Type III Civilization. A vast empire with such power and capability that they can rearrange the stars in their entire galaxy into a configuration that they find more useful. Maybe they arrange all the stars into a vast sphere, or some kind of geometric object, to minimize transit and communication times. Or maybe it makes more sense to push them all into a clean flat disk. Amazingly, astronomers have actually gone looking for galaxies like this. In theory, a galaxy under control by a Type III Civilization should be obvious by the wavelength of light they give off. But so far, none have turned up. It’s all normal, natural galaxies as far as we can see in all directions. For our short lifetimes, it appears as if the sky is frozen. The stars remain in their exact positions forever, but if you could speed up time, you’d see that everything is in motion, all the time, with stars moving back and forth, like airplanes across the sky. You just need to be patient to see it. When we do finally learn the full truth about our place in the galaxy, and we’re invited to join the Galactic Federation of Planets, I’m sure we’ll always be seen as a quaint backwater world orbiting a boring single star. The terrifying tentacle monsters from the nightmare tentacle world will gurgle horrifying, but clearly condescending comments about how we’ve only got a single star in the Solar System. The beings of pure energy will remark how only truly enlightened civilizations can come from systems with at least 6 stars, insulting not only humanity, but also the horrifying tentacle monsters, leading to another galaxy spanning conflict. Yes, we’ll always be making up for our stellar deficit in the eyes of aliens, or whatever those creepy blobs use for eyes. What we lack in sophistication, however, we make up in volume. In our Milky Way, fully 2/3rds of star systems only have a single star. The last 1/3rd is made up of multiple star systems. We’re taking binary stars, triple star systems, even exotic 7 star systems. When you mix and match different types of stars in various Odd Couple stellar apartments, the results get interesting. Consider our own Solar System, where the Sun and planets formed together out a cloud of gas and dust. Gravity collected material into the center of the Solar System, becoming the Sun, while the rest of the disk spun up faster and faster. Eventually our star ignited its fusion furnace, blasting out the rest of the stellar nebula. But different stellar nebulae can lead to the formation of multiple stars instead. What you get depends on the mass of the cloud, and how fast it’s rotating. Check out this amazing photograph of a multiple star system forming right now. In this image, you can see three stars forming together, two at the center, about 60 astronomical units away from each other (60 times the distance from the Earth to the Sun), and then a third orbiting 183 AU away. It’s estimated these stars are only 10,000 to 20,000 years old. This is one of the most amazing astronomy pictures I ever seen. When you have two stars, that’s a binary system. If the stars are similar in mass to each other, then they orbit a common point of mass, known as the barycenter. If the stars are different masses, then it can appear that one star is orbiting the other, like a planet going around a star. When you look up in the sky, many of the single stars you see are actually binary stars, and can be resolved with a pair of binoculars or a small telescope. For example, in a good telescope, Alpha Centauri can be resolved into two equally bright stars, with the much dimmer Proxima Centauri hanging out nearby. You have to be careful, though, sometimes stars just happen to be beside each other in the sky, but they’re not actually orbiting one another – this is known as an optical binary. It’s a trap. Astronomers find that you can then get binary stars with a third companion orbiting around them. As long as the third star is far enough away, the whole system can be stable. This is a triple star system. You can get two sets of binary stars orbiting each other, for a quadruple star system. In fact, you can build up these combinations of stars up. For example, the star system Nu Scorpii has 7 stars in a single system. All happily orbiting one another for eons. If stars remained unchanging forever, then this would be the end of our story. However, as we’ve discussed in other articles, stars change over time, bloating up as red giants, detonating as supernovae and turning into bizarre objects, like white dwarfs, neutron stars and even black holes. And when these occur in multiple star systems, well, watch the sparks fly. There are a nearly infinite combinations you can have here: main sequence, red giant, white dwarf, neutron star, and even black holes. I don’t have time to go through all the combinations, but here are some highlights. For starters, binary stars can get so close they actually touch each other. This is known as a contact binary, where the two stars actually share material back and forth. But it gets even stranger. When a main sequence star like our Sun runs out of hydrogen fuel in its core, it expands as a red giant, before cooling and becoming a white dwarf. When a red giant is in a binary system, the distance and evolution of its stellar companion makes all the difference. If the two stars are close enough, the red giant can pass material over to the other star. And if the red giant is large enough, it can actually engulf its companion. Imagine our Sun, orbiting within the atmosphere of a red giant star. Needless to say, that’s not healthy for any planets. An even stranger contact binary happens when a red giant consumes a binary neutron star. This is known as a Thorne-Zytkow object. The neutron star spirals inward through the atmosphere of the red giant. When it reaches the core, it either becomes a black hole, gobbling up the red giant from within, or an even more massive neutron star. This is exceedingly rare, and only one candidate object has ever been observed. When a binary pair is a white dwarf, the dead remnant of a star like our Sun, then material can transfer to the surface of the white dwarf, causing novae explosions. And if enough material is transferred, the white dwarf explodes as a Type 1A supernova. If you’re a star that was unlucky enough to be born beside a very massive star, you can actually kicked off into space when it explodes as a supernova. In fact, there are rogue stars which such a kick, they’re on an escape trajectory from the entire galaxy, never to return. If you have two neutron stars in a binary pair, they release energy in the form of gravitational waves, which causes them to lose momentum and spiral inward. Eventually they collide, becoming a black hole, and detonating with so much energy we can see the explosions billions of light-years away – a short-period gamma ray burst. How Earth could look with two suns. Credit: NASA/JPL-Caltech/Univ. of Ariz.
It’s amazing to think what the night sky would look like if we were born into a multiple star system. Sometimes there would be several stars in the sky, other times just one. And rarely, there would be an actual night. How would life be different in a multiple star system? Let me know your thoughts in the comments. In our next episode, we try to untangle this bizarre paradox. If the Universe is infinite, how did it start out as a singularity? That doesn’t make any sense. We glossed over it in this episode, but one of the most interesting effects of multiple star systems are novae, explosions of stolen material on the surface of a white dwarf star. Learn more about it in this video. Time to talk about my favorite topic: aliens. We’ve covered the Fermi Paradox many times over several articles on Universe Today. This is the idea that the Universe is huge, and old, and the ingredients of life are everywhere. Life could and should have have appeared many times across the galaxy, but it’s really strange that we haven’t found any evidence for them yet. We’ve also talked about how we as a species have gone looking for aliens. How we’re searching the sky for signals from their alien communications. How the next generation of space and ground-based telescopes will let us directly image the atmospheres of extrasolar planets. If we see large quantities of oxygen, or other chemicals that shouldn’t be around, it’s a good indication there’s life on their planet. We’ve even talked about how aliens could use that technique on us. We’ve been sending our radio and television signals out into space for the last few decades. Who knows what crazy things they think about our “historical documents”? But Earth life itself has been broadcasting our existence for hundreds of millions of years, since the first plankton started filling our atmosphere with oxygen. A distant civilization could be analyzing our atmosphere and know exactly when we entered the industrial age. But what we haven’t talked about, the space elephant in the room, if you will, is what we’ll do if we actually make contact. What are we going to say to each other? And what will happen if the aliens show up? Although there’s no official protocol on talking to aliens, scientists and research institutions have been puzzling out the best way we might communicate for quite a while. Perhaps the best example is the SETI Institute, the US-based research group who have dedicated radio telescopes scanning the skies for messages from space. Let’s imagine you’re a SETI researcher, and you’re browsing last night’s logs and you see what looks like a message. Maybe it’s instructions to build some kind of dimensional portal, or a recipe book. Whatever you do, don’t try out the recipes. Instead, you need to make absolutely sure you’re not dealing with some kind of natural phenomenon. Then you need to reach out to other researchers and get them to confirm the signal. If they agree it’s aliens, then you need to inform the International Astronomical Union and other international groups, like the United Nations, Committee on Space Research, etc. Unless they’ve got some good reason to stop you, it’s time to announce the discovery to the worldwide media. You made the discovery, you get to break the news to the world. At this point, of course, the entire world is going to freak right out. Whatever you do, however, you have to resist the urge to send back a message or build that dimensional portal, no matter how much you think you understand the science. Instead, let an international committee mull it over while you stockpile supplies in a secret alien proof bunker in the desert. What kind of message should we actually craft to our new alien penpals? Will we become fast friends, jump starting our own technological progress, or will we insult them by accident? In 2000, and international group of SETI researchers including the famous Jill Tarter devised The Rio Scale. It really easy to use, and there’s even a fun online calculator. Step 1, figure out the class of phenomenon. Is it a message sent directly to Earth, expecting a reply? Or did we merely find some alien artifact or old timey Dyson sphere orbiting a nearby star? Step 2, how verifiable is the discovery? Are we talking ongoing signals received by SETI researchers, or a hint in some old data that’s impossible to confirm? Step 3, how far are we talking here? Hovering over Paris? Within our Solar System, or outside the galaxy? Step 4, how sure are you? 100% certain, and everyone agrees because they can all see that enormous mothership floating above London? Or nobody believes you, and they’ve locked you up because of your insane ramblings and misappropriation of government equipment? Punch in your numbers and you’ll get a rank on The Rio Scale between 0 and 10. Level 0 is “no importance” or “you’re a crank”, while level 10 is “extraordinary importance”, or “now would be a good time to panic”. SETI researcher Seth Shostak, calculated the Rio Scale for various sci-fi movies and shows. The first message from aliens in Independence Day would count as a 4. While the obliteration of the White House by a massive floating alien city that everybody could see would count as a 10.
the messages received in Contact, and independently confirmed by researchers around the world would qualify in the 4-8 range, while the monolith discovered on the Moon in 2001 would be a solid 6. Now you know how important the discovery is, what do you say back to those chatty aliens? This falls under the term CETI, which means Communications with Extraterrestrial Aliens, which shouldn’t be confused with SETI, or the Search for Extraterrestrial Aliens. And it turns out, that horse has already left the stable. When the Pioneer and Voyager spacecraft were constructed, they were equipped with handy maps to find Earth’s precise location in the Milky Way. In 1974, Carl Sagan and Frank Drake who composed a message in alienese and broadcast it into space from the Arecibo Observatory. In 1999 and 2003 a series of signals were transmitted towards various interesting stars. The messages contained images of Earth, as well as various mathematical principles that could be used by aliens as a common language. We’ll know if that was a good idea in a few decades. In 2015, scientists like David Grinspoon, Seth Shostak and David Brin collected together to discuss if it’s a wise idea to send messages off into space, to broadcast our existence to potentially hostile alien civilizations. According to Seth Shostak, the best message we can send is the entire internet. Just send it all, they’ll work out what we’re all about. The science fiction author David Brin thinks that’s a terrible idea, and we should keep our mouths shut. Personally, I think the aliens already know we’re here. If they wanted to invade and destroy our planet, they would have done it millions of years ago when early life made it obvious this planet was inhabited. The jig is up. It’s a mind bending concept to imagine what life might be like if we knew with absolutely certainty that there’s an alien civilization right over there, on that world. I’m sure people will freak out for a while, but then we’ll probably just go back to life as normal. Human beings can get bored by the most surprising and amazing things. If you learned there was definitely an alien civilization out there, how do you think humanity would respond? Let me know your thoughts in the comments. During a hearing last week before the U.S. House Science and Technology Committee SETI scientists Seth Shostak and Dan Werthimer asserted that solid evidence for extraterrestrial life in our galaxy — or, at the very least, solid evidence for a definitive lack of it — will come within the next two decades. It’s a bold claim for scientists to make on public record, but one that Shostak has made many times before (and he’s not particularly off-schedule either.) And with SETI’s Allen Telescope Array (ATA) continually scanning the sky for any signals that appear intentional, exoplanets being discovered en masse, and new technology on deck that can further investigate a select few of their (hopefully) Earth-like atmospheres, the chances that alien life — if it’s out there — will be found are getting better and better each year. Would you put your bet on E.T. being out there? Actually, you can. Thanks to the internet and the apparently incorrigible human need to compete you can actually place a wager on when alien life will be discovered, via an Irish online betting site. Of course, whether you personally would place a wager on such things is purely personal preference, and neither I nor Universe Today condones or supports gambling, for aliens or otherwise. (And the legalities of doing so and any and all results thereof are the sole responsibility of the reader.) But it is interesting that we now live in a time when wagering on the discovery of alien life sits just a click away from the results of the Kentucky Derby, French Open, or World Cup. Learn more about SETI and how the ATA works here, and read Dan Werthimer’s May 21 statement to the House Committee here. Some day, human explorers will land a spacecraft on the surface of Europa, Enceladus, Titan, or some other icy world and investigate first-hand the secrets hidden beneath its frozen surface. When that day comes — and it can’t come too soon for me! — it may look a lot like this. One of a series of amazing photos by Stefan Hendricks taken during the Antarctic Winter Ecosystem & Climate Study (AWECS), a study of Antarctica’s sea ice conducted by the Alfred Wegener Institute in Germany, the image above shows researchers working on the Antarctic ice during a winter snowstorm. It’s easy to imagine them on the night-side surface of Europa, with the research vessel Polarstern standing in for a distant illuminated lander (albeit rather oversized). One of the goals of the campaign, called CryoVex, was to look at how ESA’s CryoSat mission can be used to understand the thickness of sea ice in Antarctica. The extent of the Antarctic sea ice in winter is currently more than normal, which could be linked to changing atmospheric patterns. Antarctica’s massive shelves of sea ice in winter are quite dramatic landscapes, and remind us that there are very alien places right here on our own planet. Are we too hopeful in our hunt for extraterrestrial life? 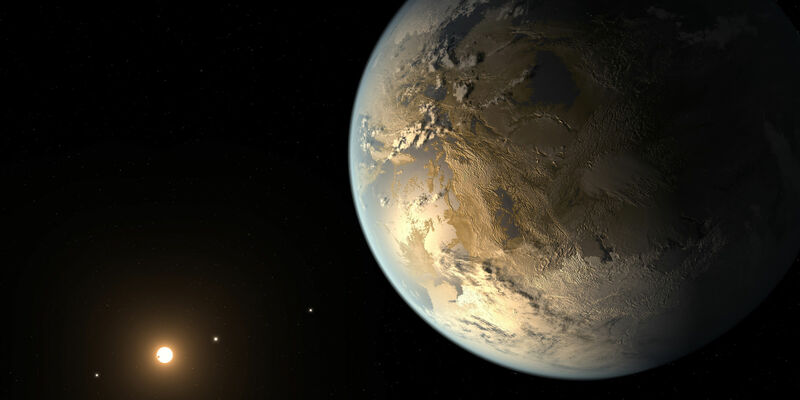 Regardless of exoplanet counts, super-Earths and Goldilocks zones, the probability of life elsewhere in the Universe is still a moot point — to date, we still only know of one instance of it. But even if life does exist somehow, somewhere besides Earth, would it really be all that alien? In a recent paper titled “Bit by Bit: the Darwinian Basis for Life” Gerald Joyce, Professor of Molecular Biology and Biochemistry at the Scripps Research Institute in La Jolla, CA discusses the nature of life as we know it in regards to its fundamental chemical building blocks — DNA, RNA — and how its ability to pass on the memory of its construction separates true biology from mere chemistry. “Evolution is nothing more than chemistry plus history,” Joyce said during a Public Library of Science podcast. The DNA structures that evolved here on Earth — the only place in the Universe we know for certain that life can thrive — have proven to be highly successful (obviously). So what’s to say that life elsewhere wouldn’t be based on the same basic building blocks? And if it is, is it really a “new” life form? To arise in the first place, according to Joyce, new life can take two possible routes. Either it begins as chemical connections that grow increasingly more complex until they begin to hold on to the memory of their specific “bit” structure, eventually “bit-flipping” — aka, mutating — into new structures that are either successful or unsuccessful, or it starts from a more “privileged” beginning as an offshoot of previous life, bringing bits into a totally new, immediately successful orientation. That’s not saying that there’s no life elsewhere in the Universe… just that we have yet to identify any evidence of it. And without evidence, any discussion of its probability is still pure conjecture. Even though exoplanets are being found on a nearly daily basis, and it’s only a matter of time before a rocky, Earthlike world with liquid water on its surface is confirmed orbiting another star, that’s no guarantee of the presence of alien life — despite what conclusions the headlines will surely jump to. Still, we will continue to search for life beyond our planet, be it truly alien in nature… or something slightly more familiar. Why? And who knows… if any aliens out there really are a lot like us, they may naturally be searching for evidence of our existence as well. If only to not be so lonely. Listen to the full PLoS podcast here. The Curiosity rover is currently on its way to Mars, scheduled to make a dramatic landing within Gale Crater in mid-August and begin its hunt for the geologic signatures of a watery, life-friendly past. Solid evidence that large volumes of water existed on Mars at some point would be a major step forward in the search for life on the Red Planet. But… has it already been found? Some scientists say yes. Researchers from universities in Los Angeles, California, Tempe, Arizona and Siena, Italy have published a paper in the International Journal of Aeronautical and Space Sciences (IJASS) citing the results of their work with data obtained by NASA’s Viking mission. The twin Viking 1 and 2 landers launched in August and September of 1975 and successfully landed on Mars in July and September of the following year. Their principal mission was to search for life, which they did by digging into the ruddy Martian soil looking for signs of respiration — a signal of biological activity. A six-inch-deep trench in the Martian soil dug by Viking 1 in February 1977. The goal was to reach a foot below the surface for sampling. The results, although promising, were inconclusive. Now, 35 years later, one team of researchers claims that the Viking landers did indeed detect life, and the data’s been there all along. By applying mathematical complexities to the Viking data for deeper analysis, the researchers found that the Martian samples behaved differently than a non-biological control group. While some critics of the findings claim that such a process of identifying life has not yet been perfected — not even here on Earth — the results are certainly intriguing… enough to bolster support for further investigation into Viking data and perhaps re-evaluate the historic mission’s “inconclusive” findings. The team’s paper can be found here. Image credits: NASA/JPL-Caltech. Also, read more on Irene Klotz’s article on Discovery News.